A fresh, vibrant and tasty salad using seasonal ingredients and fruit. Adding fruit to your salads not only adds a touch of sweetness (avoiding the need to drizzle an oily dressing over the top) but adds to your daily consumption of fruit which some of us struggle to fit in as snack on it's own. Adding fruit also helps to keep blood sugar levels at bay as you're less likely to reach out for unhealthy food choices laden with processed and refined sugars. Gently toss through the spinach leaves, currants, pepitas, roughly chopped mint and crumble over the cheese. A combination of low GI dried fruit, nuts, seeds and the all important super foods, this muesli will keep you full all morning and give you that much needed burst of energy we all need to start the day. The beauty of this recipe is it can be changed to suit your tastes, mood and what you have left in your pantry! I highly recommend buying nuts, seeds and dried fruit in bulk so you're not not needing to replace these foods too frequently. You will also save time and energy better spent squeezing in another workout! 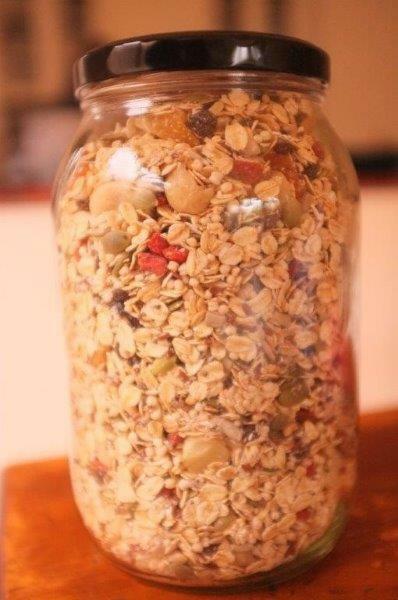 I prepare a batch of this muesli mix in a 3 litre container and it lasts me ages! Serve with fresh berries, grated green apple, natural yoghurt and a sprinkle of cinnamon. Low fat dairy, soy or unsweetened almond milk is optional OR coconut water! 1/2 to 3/4 cup of dried Turkish apricots. Snipped to the size you like.